The 2013 edition of South by Southwest followed its standard script, with literally hundreds of up-and-coming artists competing for media and fan attention in a maddeningly random assemblage of venues in Austin, Texas. Fortunately for UK artists, the British Music Embassy was there to help assure they would not be lost in the scuffle. For the past six years, this initiative has supported UK artists playing at "South By", putting key music events into a single, prominent Austin venue, Latitude 30, and promoting their appearances. Over the course of the week, over 50 UK bands, from England, Scotland, Northern Ireland and elsewhere, played the British Music Embassy stage. To help ensure those appearances are well received, the British Music @ SXSW partnership arranges a high quality sound system at Latitude 30 — not something one can expect at every SXSW venue. Working through London-based Cato Music, the "embassy" called for an appropriately British production, with both PA and monitor loudspeakers from Turbosound, and digital mixing consoles by Midas. "Despite working with tight deadlines the first day, the PA at Latitude 30 went up in a very short space of time, and sounded effortlessly brilliant very quickly as well," said production manager Simon Buckley of Cato Music. "With support from Turbosound and Midas, the reputation of the British Music Embassy at Latitude 30 continues to grow." Bastille was one band hoping to port their UK success into the American market through SXSW. Though recently at the very top of the British charts, the group is still relatively unknown across the Atlantic. The band’s sound engineer, Paul Cooper, was quite impressed with the British Music Embassy’s system. 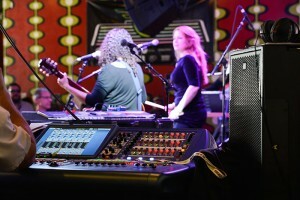 "We played three gigs at South By and the system at Latitude 30 was easily the best system I encountered," he reports. "We didn’t have a lot of time to play around with it, but the Turbosound rig sounded awesome from the get-go. It was very simple to get a good sound, and I imagine it would be even better with time for a proper sound check. I’d be happy to see it again." For the 300-capacity Latitude 30, the Turbosound rig consisted of twin 3-box Flex Array hangs using the self-powered TFA-600HDP speakers. Low frequency support came courtesy of two TSW-218DP subwoofers. Up on stage, monitors were provided by four TMW-115 wedges with a NuQ-15DP used for drum fill. All speakers were self-powered save the floor wedges, which used the Turbosound RACKDP-50 smart amplifier. Both the house and monitor mix positions used the Midas PRO2 console. Front of house sound engineer Jimmy Parkin was on hand the entire week, and reports the system excelled across the wide variety of bands that played. "The Flex Array PA handled both delicate solo voice and acoustic guitar and six-piece rock bands without worry," he reports. "Throughout the week, touring engineers were regular in their praise of finding such a good system in such a small venue." According to P-C Rae, who coordinates bookings for the British Music Embassy with SXSW, the sound system is a key element in their success. "The importance of high production standards at showcase events such as South By is crucial, especially when bands have spent so much to get there," he says. "The production from Cato Music, MIDAS, and Turbosound enables us to have one of the best, if not the best, tech set-ups of any comparable venue in Austin, and gives UK bands the best possible stage on which to perform." Production manager Simon Buckley agrees. "With the support of companies like Turbosound and Midas, the reputation of the British Music Embassy at Latitude 30 is growing every year," he says. 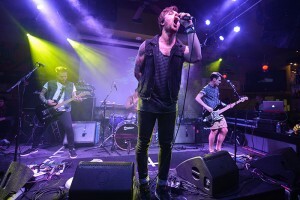 "We had nothing but positive comments expressed by the bands, their engineers, and the audiences. Everyone was happy."